What makes a farmer's wife happier than a bucket of grass roots? 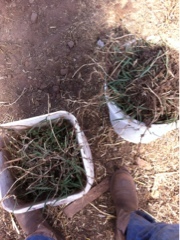 Two buckets of grass roots! My uncle owned a house surrounded by a lot of land when I was a kid. We visited a couple times a year: my grandparents were there, and my other uncle and his family lived on the cul de sac. Just a couple of houses, a pond, woods and field of grass. With 6 kids in my family a total of 20 years apart, there were times when everyone of us made the trip and times when just a few did. When I was 11, we visited in springtime. By that time my grandfather was not in good health but was still able to get outside. Into the garden we went, my younger brother, my cousins and I. We were put to work pulling the grass from between the bricks in the brick walkway. Many small hands cleared that path quickly. There are no brick pathways here on the farm. Inside the hoophouse was completely overgrown when we moved here, and the previous owners kept exotic birds in there...and it sure seems like some of those weeds came from exotic seeds! The grass is an ongoing battle. Each year we knock more back in the wintertime. As spring approaches the grass begins to pop again, and it is time to get it out. Yesterday time was spent in the back of the hoophouse, furthest from the entrance, with tiny blades of grass showing and tons of roots underground. While there are still grass shoots hiding out there, many were pulled up yesterday. We use only drip tape in the hoophouse, that way little water gets to the walkways, which also helps to slow the grass growth. We are getting there, we both know it, with defined beds, few weeds, lots of seeds sprouting all over and many peas in too. I remember my grandparents growing tomatoes. And rhubarb. I don't remember there being a whole lot more. But the satisfaction of rooting out what is not wanted still remains.